Coffee Chocolate Gelato. 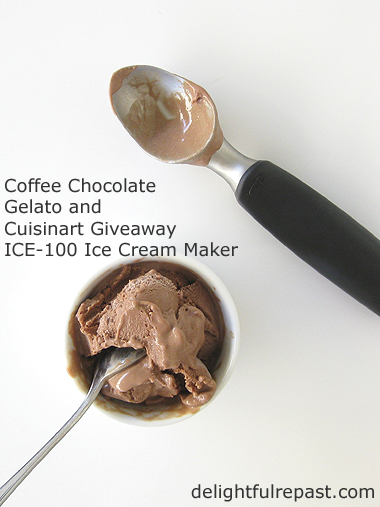 Something I never thought of making myself until I got the Cuisinart ICE-100 Compressor Ice Cream and Gelato Maker. Besides the regular ice cream paddle, it has a gelato paddle specially designed to incorporate less air into the gelato; less air is one of the differences between gelato and ice cream. I've owned the Cuisinart ICE-21 Frozen Yogurt-Ice Cream-Sorbet Maker for several years and still love it. I liked to keep the freezer bowl in the freezer at all times so it was ready to go on a moment's notice. But I have very limited freezer space I'm trying to maximize more than ever just now, so the ICE-100, which is a self-refrigerating compressor machine has replaced it in my affections. And don't even get me started on the old-fashioned ice-and-rock-salt-wooden-bucket kind. You know I think "old-fashioned" is a good thing, so I'm not using it in a pejorative way here, just by way of description! In theory, I love that kind of ice cream maker and even had one back in the day. They are perfect for making a large batch of ice cream for a crowd. But these days I just make small batches and so appreciate the just-plug-it-in convenience of the compressor unit. No rock salt. No ice. No insert bowl that needs to be frozen for 24 hours. It's so easy! And Cuisinart is going to send one to one of YOU! Some gelatos (actually, I think the plural might be "gelati") have eggs, but I developed this recipe to be a no-egg gelato. I use all organic ingredients. If you can't get organic milk and cream, at least get a brand that doesn't have hormones. 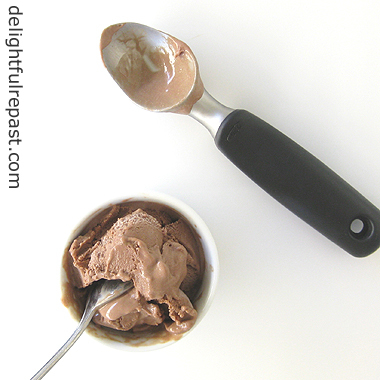 I've posted lots of ice creams, including Chocolate Ice Cream, Vegan Chocolate Ice Cream and Chocolate Frozen Yogurt. Mr Delightful says this recipe is "the perfect balance of chocolate and coffee; I can taste both." What is your favorite ice cream, gelato, frozen yogurt, sorbet or non-dairy frozen dessert? 1 Put the coffee in a single-cup filter bag, place it in a teacup and pour over 1/3 cup boiling water; let brew for 2 minutes, then remove bag, pressing out all the liquid, making about 1/4 cup triple-strength coffee. In 1-quart saucepan, heat milk just to a simmer. 2 While milk is heating, in 2-quart saucepan whisk together sugar, cocoa, cornstarch and salt. Whisk in the cream until mixture is smooth. 3 Whisk in hot milk. Over medium heat, stir constantly and cook until the mixture thickens, about 5 minutes; do not boil. Whisk in vanilla extract and brewed coffee. 4 Pour into a 1-quart glass measure (the spout will make pouring mixture into the machine easier). You should have 3.5 cups; if you don;t, just stir in a bit of milk or cream. Cover and refrigerate until well chilled, at least 8 hours or up to a day or two (I always aim for 24 hours). 5 Put the gelato paddle into the mixing bowl of the Cuisinart ICE-100 compressor ice cream and gelato maker; whisk the chilled mixture, pour it into the mixing bowl and put on the lid. Turn unit on, set timer for 30 minutes* and press Start; let spin until thickened. Or follow the directions for whichever ice cream maker you have. While gelato is churning away, put the container you'll be storing the gelato in into the freezer (cuts down on the melting when you're transferring the gelato from the freezer bowl to the storage container). * Directions said to set for 40 minutes, but I found my chilled mixture took only 30 minutes. So I would suggest checking it every 5 minutes after the first 20 minutes or so, at least when making a new recipe the first time. 6 Turn the unit off by pressing the power button, remove the lid, lift the mixing bowl out by its handle and remove the paddle from the bowl. Transfer the soft gelato to the chilled freezer-safe airtight container, and place in freezer for at least 4 hours. Remove from freezer about 15 minutes before serving. That will make it soft enough to scoop (or spade) and to have that softer (than ice cream) gelato thing going on. Update 09/14/16: The giveaway has closed. The winner has been announced in the comments. This giveaway is open to US residents 18 years of age or older. Leave a comment below (one entry per person) that includes the first thing you'd like to make with it. Please include your email address in the body of your comment. Must enter by 11:59 p.m. Eastern time Wednesday September 14. Winner will be chosen by random drawing and be announced here in the comments before noon Eastern time on Thursday September 15. If I don't hear back from the winner of the random drawing by noon Eastern time Sunday September 18, another drawing will be held and a new winner selected from the original entrants (those who commented before the giveaway deadline). 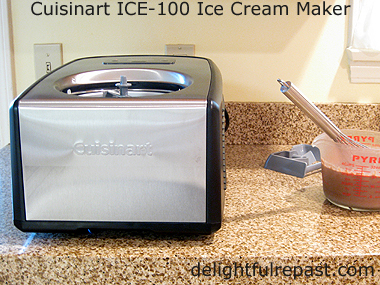 Disclosure: Cuisinart provided an ice cream maker for review purposes and one for the giveaway. I received no compensation. The views expressed here are entirely my own. I always tell my readers what I really think! List all my favorite ice creams? Oh, stop me before I kill again! The list would force your readers to scroll for three minutes. But at the moment Häagen-Dazs Dulce de Leche is lurking in a dozen cartons in my freezer (only 945 cal per pint). And a Cuisinart ICE-100 giveaway? Wow! The gelato thing fascinates me. Less air, huh? Does it work on authors addicted to Häagen-Dazs Dulce de Leche? 5 cleavers! Sully, I thought this one might earn the coveted 5 Cleaver Award! Thank you so much! I'll take it with a huge big thank you if I am chosen. And, my favorite is either vanilla yogurt or Blue Bell's [Texas home brand] black walnut ice cream.....fattening, I know. Thanks, HA. I do love black walnut ice cream, but I've never made it; I think that kind of walnut is pretty difficult to deal with! I would make my very own Coffee ice cream if I am blessed to win this generous giveaway. Many thanks for the chance to win..
BJ, coffee ice cream is one of our very favorites too, which is kind of funny because my husband has never had so much as a sip of coffee in his entire life! Goodness, that looks so delicious! If I were to win I would first make homemade bananas foster ice cream! Starla, that would be delicious! The first thing I would make is marrionberry pie ice cream! YUM! Ohhh Brenda, sign me up for a big bowl of that! The first thing I would make would be vanilla ice cream with pecans. Or walnuts. Maybe almonds. I love nuts and ice cream! I follow Cuisinart on twitter @rusthawk. What a lovely giveaway, Jean. We love ice cream and gelato at our home and homemade is the best! I love butter pecan, but just about any suits me! I shouldn't be allowed near gelato! Danger, Will Robinson! But that won't stop me from being included in the drawing. The first thing I would make is peppermint stick! It's my very favorite and I can't find anywhere that sells it after the Christmas season! What a nice thought! Thanks for coming by the Gypsy and your comments! You're right about not wanting to own the gingerbread. They're small so they don't "seem" like they'd be overly labor intensive -- until you think about wood rot, keeping the paint fresh, working the paint around all those itty bitty pretty bits, and then there's the roof...! Rusthawk, I do, too. I think the only ice cream with nuts I've posted, though, is the Butter Pecan. Check it out. Martha Ellen, I actually posted my Butter Pecan recipe a few years ago. Check for it on my Recipes index page under Desserts. Jeanie, nope, I couldn't deal with all that home maintenance! Whew! But peppermint stick ice cream. I haven't had that in a zillion years. I'll definitely have to give that one a whirl. Thanks, 7thavesweets! It's really good, even if I do say so myself! I too grew up with with the old fashioned ice cream maker with ice and salt. So many fond memories...but this is 2016 so a countertop ice-cream maker just makes sense! Lately Cardamom ice cream has been my favorite and I bet it would go terrifically well with your peach sheet cake!!! Oh Richard, yes, cardamom ice cream would be perfect with the peach cake! I would make plain old vanilla but then that's when the fun begins. Fresh fruit, swirls of fudge or caramel, chopped butterfingers etc. My daughter's favorite is peach.. The only way to get a good peach flavor is to make it yourself. nkancel01, nothing "plain old" about a good homemade vanilla ice cream! Homemade peach is one of my favorites, too, and I blogged my recipe a while back. You can find it under Desserts on my Recipes index page. I can't wait to make my own ice cream, vanilla flavor first. 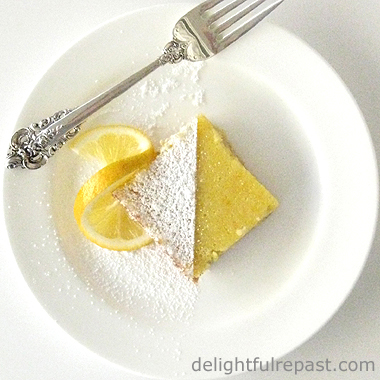 I follow Delightful Repast on Pinterest. HS, it is soooo much fun! This afternoon I stirred up a frozen yogurt I'll be churning tomorrow afternoon. Can't wait! Hi Jean, thanks so much for stopping by my blog 'G'day Souffle'. My favorite kind of frozen dessert is definitely ice cream, since is has eggs and the 'whole box and dice.' I'd say that Oreo cookie ice cream is my favorite, although your butter pecan looks worth a try! I'm boring. I would make vanilla ice-cream. Thanks, Fran! I haven't had an Oreo in years, but I remember even as a child I didn't like the filling so I always pulled the cookie apart, scraped off the filling and ate only the cookies! Not boring at all, Leslie! Vanilla is wonderful! Ooh, I've been wanting to make a vegan chocolate chip ice cream. Thanks for sharing at the Blogger's Pit Stop! I followed Cuisinart on Twitter. Debbie, thank you. And thank you for following Delightful Repast on Twitter and Pinterest! Thank you for this great giveaway opp! I would first make a tropical gelato...passionfruit, maybe. Yum. My fingers are crossed! Chocolate is my favorite- this recipe looks amazing. My Fave is chocolate almond ice cream, coffee added to it is a close second! Quinn, that sounds wonderful! Guava would be another tasty tropical. Melissa, it is quite a piece of equipment! Yes, pop into a kitchen store. Kitchen stores and hardware stores are my favorite kind of shopping! Cheryl, I haven't had chocolate almond in a while. Must put it on my things-to-make list! So creamy, rich and tempting, Jean. I have many fond memories of those old hand crank/salt ice cream makers from my childhood. I love homemade ice cream and would love to win this machine. Great give away! Angie, thank you! Hope you have a great weekend as well. Oh my! Yum! Just the idea of something so smooth and chocolate makes my mouth happy. I remember my grandmother making ice cream the old fashioned way when the whole family got together and it was such a special treat. Ann, thank you, And it's so wonderful to hear from you! I hope you are well and enjoying the end of summer. Just plain old vanilla to start with....then start experimenting!! We used the old crank type, ice and salt for family get togethers....then we had lots of hand to do the cranking!! Fun times!! Thank you, Shirley! Glad you like my recipes. Yes, when you have lots of hands to do the cranking, those old crank-types are such fun. But when it's just my two hands, just let me plug it in and go about my business! I enjoy using my Cuisinart ice cream machine, too. It's so easy and faster than traditional machines! Thank you for linking up at the #HomeMattersParty this week! Thank you, Nicole! Much appreciated. Two of my favorite combinations -- coffee and chocolate! Hubby has been adamant about purchasing and ice cream maker because he has not self-control. When we have ice cream in the house he sneaks in the freezer and eats it all :-( If I had another ice cream flavor with would be butter pecan. YUM! Given the chance -- I wouldn't refuse any ice cream. Great recipe! Thanks, Marilyn! That's my kind of cardio! I would make strawberry ice cream using fresh strawberries and maybe some chocolate chips thrown in for good measure! Ariel, thank you for entering and for following! CarolSue, thank you. I love fresh strawberry ice cream, too! Thank you for the follows of Delightful Repast and Cuisinart! Oh my, Jean, I think I would have to try the recipe you posted first thing in this machine! It sounds delicious as I love both chocolate and coffee flavored ice cream. Lily, thank you. So good to hear from you! I hope you'll feel better soon. And do let me know how the peach scones turn out for you. Your gelato looks so yummy, Jean! I checked out your peach cake, too, and I think I'll have a slice of that with some of your gelato! What a fabulous giveaway from Cuisinart!! Thank you, Kitty. I almost never have ice cream with cake or pie because I like hot tea with it, and the cold ice cream and hot tea make my teeth hurt! "Here is a carrot. Chew it!!" Now that would be my sort of dish right now!!Ha! Ha! Tony, how did you guess? That's exactly what I'm posting next Thursday -- "Here is a carrot. Chew it!" Glad to hear you're in fine fettle. I don't worry about a slightly high cholesterol level. I just made another batch of clotted cream! Looking at this post I wouldn't say you are low tech at all. I'd make any sort of chocolate caramel ice cream! Thank you, Anita, for that vote of confidence! :-) Chocolate caramel sounds delightful! Jean, this recipe sounds amazing. I would either try this or make some butter pecan. I am a sucker for butter pecan. Followed you and Cuisinart on Twitter as @beboobailey. Good luck with your giveaway and thanks for the opportunity. Wonderfluf, I love strawberry ice cream, too, and posted my recipe for it quite some time ago. Just check the Recipes index page. Thanks, Brandon. And thanks for the follows. I'm really excited to be able to offer this giveaway! I would like to try making some pumpkin spice ice cream to get ready for fall. Mmm ... yes, it's about time for pumpkin spice ice cream! Chocolate and coffee together; what a treat! The Cuisinart will be a wonderful gift for someone. I have never made ice cream or gelato but yours really does looks wonderful! Thanks for sharing and enjoy your day, Jean. Thanks, Sandi! I generally prefer desserts that go with a cup of tea, but my husband does love his ice cream, gelato, frozen yogurt, etc. Summer, thank you. I haven't made any ice creams yet, my husband is into frozen yogurts right now. Ohh, how I'd love to have this wonderful gelato right now, our Summer is still so very hot, indeed, hottest than in August, so a gelato would be so very welcome in this moment of the afternoon ! Thank you, dear Dany, and thank you for letting me know whether I was right about the Italian plural. I was hoping you would! You make everything you create sound so easy Jean and a new kitchen machine that makes the job more efficient is my kind of toy! I live in Canada so can't enter the draw but know someone will be happy. Judith, thank you so much! You are too kind! So, since childhood I have loved Raspberry Sorbet, but my true love is any type of ice cream with peanut butter in it. Since I live in Ohio, I bet I would make some kind of a Buckeye Ice Cream. Michelle, I like both of those too! It would be good to have one small scoop of raspberry sorbet and one small scoop of vanilla ice cream. With this machine, it's easy to make multiple batches. My neighbor always makes ice cream in her Cuisinart. I think I need to give it a try. Thank *you*, Carol! I think you'll find ice cream making a lot of fun! Laura, thanks! Coffee and chocolate IS a classic combination, each makes the other even better! Thank you, Emily! I hope you'll give the recipe a try if you have any sort of machine. Congratulations, this post was among the most clicked on The Blogger's Pit Stop and will be featured on Friday. Well done. Wonderful looking dish! Love homemade ice cream -- SO, so good. And easy. Good job! Thanks. Thanks so much, David! I hope you'll make some soon to help you keep cool during this endless summer! If i win this giveaway, i would love to whip up a batch of some tropical flavours.. maybe a pina colada gelato. Prachi, thank you. A pina colada gelato sounds tempting! I'd also like to try something with guavas. *Giveaway Winner Announced* - The winner of the Cuisinart ICE-100 ice cream and gelato maker, by random drawing, is Quinn. Quinn, as soon as you send me, delightfulrepast at aol dot com, your name, address and phone number (required by shipper), Cuisinart will ship the ice cream maker to you. Congratulations! If I don't hear from the winner of the random drawing by 11:59 am Eastern time Sunday, September 18, another drawing will be held and new winner selected from among the original entrants (those who commented before the giveaway deadline). You are soooo welcome! I'm glad you're excited about it -- it is a marvelous machine!